Browse the FAQs below for the answers to your questions. For product information and dealer pricing, please contact your local Boston Whaler dealer. Pricing and parts are available through your nearest Boston Whaler dealership only. Why are there two bilge pumps in my new 2018 170 Montauk and how do they work? There are two 1100 GPH bilge pumps used on the newly redesigned 2018 and 2019 170 Montauks. The first (the main bilge) is located in the lower bilge, (where the built-in 25 gallon fuel tank is located) while the other pump (auxiliary bilge) is located in the sump area just forward of the motorwell, under the sump cover. Both pumps have their own float switch, that allows the pump to operate when necessary, along with their own switch at the helm that allows you to choose either the Automatic (float switch) or Manual mode. The main bilge pump is wired “hot” or direct to the battery, just in case. This allows the pump to come on when no one is on the boat if water was to enter the lowest section of the bilge. The auxiliary bilge pump is wired to the battery switch. This was designed this way to allow you to shut off the auxiliary/sump bilge pump, preventing the battery from draining due to heavy rains, etc. When moored, the 170 Montauk is designed so you can just remove the sump drain plug and water will only enter the sump area. Due to the foam flotation any rain water will flow to the sump and out the bottom drain. How do I repair a hole through the fiberglass and into the foam? The procedure below provides a guideline to repair a hole 1” in diameter. 1. Clean up any rough edges of the puncture (hole) using a needle router or Dremel tool and dig out the foam approx. ¾” behind the fiberglass. An L shaped allen wrench in a drill works great for this. Make sure the foam is scraped clean behind fiberglass. 2. Fill the hole with “Mash” (a combination of polyester resin, chopped fibers (about 1” long) and either milled fibers, Cabosil or micro balloons to thicken). 3. After “Mash” has cured, taper grind fiberglass approx. 1 ½” around hole. 4. Mat over area with multiple layers of 2 oz. mat until back to original thickness. After mat/resin has cured, grind it flat and flush with original skin. Use a straight edge if necessary. 5. Use fairing material (compound or gelcoat paste) to fill in low spots and prepare surface with 100 grit sandpaper, beyond repair, to apply gelcoat finish. Note: This process can be used for larger holes and/or different sections and thicknesses of the hull. You must take into consideration the amount of stress the area will receive. For example: The fiberglass along the keel will be thicker, requiring more materials to be added (including layers of woven roving). Some heavily stressed areas require multiple layers of Cofab (Biaxial & Unidirectional) materials. If a hole is larger than 1” it will be necessary to taper grind a larger surrounding area to allow you to build up more material and to tie into surrounding good fiberglass. Did Boston Whaler ever produce a sailboat? Yes, Boston Whaler produced and sold several sailboat models throughout the years. Trident (Sunfish Type Craft), 1958-1960. Squall (Rowing and Sailing), 1965-1979 (revised edition between 1983-1985). Harpoon 5.2 with cuddy, 1976-1983. Harpoon 5.2 sans cuddy, 1978-1983. I would like to install a bow-mounted trolling motor on my Boston Whaler. How do I know what shaft length to order, and how many pounds of thrust will be required? Prior to installing a bow mounted trolling motor, reference the reinforcement guide for your model to ensure that the proper reinforcements are molded into your boat. Most trolling motor manufacturers recommend that the center of the motor be at least 9 inches under the surface of the water. For a general idea of the needed shaft length, measure from the top of the bow to the waterline, as typically loaded. With a measurement of up to 16 inches, the shaft length should be a minimum of 36 inches; from 17 to 22 inches, a minimum of 42-inches of shaft length is needed; from 23 to 28 inches, the shaft length should be 48 to 52 inches; and from 29 to 34 inches, the shaft length should be 54-62 inches. If you fish in rough waters, add 5 inches, and if your boat is hand-steered, you should add another 12 inches to get the handle in a useable position. For thrust, as a rule, you should always go with the highest thrust motor that your budget will allow. That way, you will have plenty of reserve power when the wind and currents get stronger. If you typically fish with heavier loads or in rough waters, you may want to choose the next higher thrust motor. Be sure to reference a diagram that shows where reinforcement materials have been installed to support trolling motors, or contact the Boston Whaler Customer Service Department. For more information regarding trolling motors, please visit www.motorguide.com. My area is now using ethanol in its fuel, but I've heard that it can damage fiberglass fuel tanks. Does my Boston Whaler have a fiberglass fuel tank, and how will the ethanol/fuel mixture affect my boat? Boston Whaler does not install any fiberglass fuel tanks at the factory. Only aluminum and polyethylene have been used throughout the years. However, the 10 percent ethanol/fuel mixture will not harm either of those materials. Your Mercury engine and Boston Whaler fuel system components will withstand up to 10 percent ethanol content in gasoline, but you should not exceed this amount. Check fuel hoses and fittings for deterioration regularly, and replace as needed. When storing your boat for long periods of time (two months or more) it’s best to remove all fuel from the tank. This is recommended because as the temperature goes up and down in partially full tanks, the void space above the fuel allows air movement that can draw out water through condensation. Ethanol draws that water into the fuel. Significant amounts of water will cause the ethanol and water to separate from the bulk fuel and sink to the bottom of the tank where they can be pumped directly into the fuel system and engine, potentially causing significant problems. Because of this, it is best to first introduce an ethanol fuel mixture into a dry tank and be careful to keep the water out. Other precautions include keeping the fuel tank full (to prevent condensation) and always having several fuel filters handy (ethanol will act as a cleaner to gummy deposits). If it is not possible to remove all of the fuel from the tank, the next best option is to keep the tank full and add a Mercury-recommended fuel stabilizer. When starting the boat after a long storage, run the engine for 10 minutes, shut off the fuel supply, and then let the engine run until it stops. Top off the fuel tank and cap any openings to reduce the amount of airflow that could cause condensation. If your boat has an after-market, above deck, fiberglass fuel tank produced before 1991, you may want to consider replacing it with an updated version. The resins in the older fiberglass fuel tanks may not be compatible with the ethanol, and they can end up being carried into the engine, where severe damage could occur. Can I install a heavier four-stroke engine on my older Boston Whaler, and if so, what is the maximum engine weight for my boat? On newer models, Boston Whaler tests each available engine combination on the boat to determine a maximum engine weight for best performance and safety. On older models, testing did not include a maximum engine weight, since the boats were designed to support the lighter, two-stroke engines available at the time. In order to get an idea of how your boat will perform with the extra weight of a four-stroke engine, first determine the weight of your current engine(s). A good source for engine weight on older outboards is www.Nadaguides.com. Then, add weight to the stern area equal to the difference between the original engine and the new choice. Next, test the boat out as typically loaded under normal use. Too much aft weight may increase planing time, cause the boat to porpoise at mid-throttle and cause it to sit with a stern-down disposition (hampering performance and possibly causing draining issues). Installation of an engine that is heavier than approved by Boston Whaler can cause structural damage to the transom. Weight distribution is very important. When adding weight to the stern, it may be necessary to move some weight forward to help compensate. Moving portable fuel tanks and battery boxes may assist with a better balance. Matching your boat and engine with the right-sized propeller can make a big difference in performance. For most recreational boats, it is a simple process. First, you will need to determine how fast your engine should operate with wide-open throttle (WOT). You can find this information in your engine owner’s manual. If not, your dealer can provide it to you. Outboard engines generally have WOT ranges of 5,000 to 6,000 revolutions per minute (rpm). Next, you will need to determine how fast your engine runs at WOT. Before you make the test, check to see that your propeller is neither dinged nor bent. Now, take your boat out on the water with a normal load and weight distribution and adjust the trim as you usually do. Run it with WOT. If you have a reliable tachometer, it will tell you how fast your engine is running. If your engine is running too slow, replace your propeller with one with less pitch. If it runs too fast, choose one with greater pitch. In general, one inch of pitch is equal to about 200 rpms. So, if your engine is running, for example, 400 rpms too slow at WOT, reduce the pitch of your propeller by two inches. Some dealers will let you try out propellers and return them if you have not dented, bent or scratched them. Continue to try different propellers until you have one that matches your boat and engine. For an excellent propeller guide for Mercury engines, please visit the Mercury Marine website at: www.mercurymarine.com, and choose “Propeller Selector” from the dropdown menu. Can I still obtain parts for my older boat? Most parts and accessories are still available through your local Boston Whaler dealer. While some of the original parts may no longer be available, your dealer can usually cross-reference a newer product to meet your needs or refer you to a vendor that can assist you. Recent Models: Order through your local Boston Whaler Dealer. Anderson’s Manufacturing & Upholstery, Inc.
William J Mills & Co.
For an excellent propeller guide for Mercury engines, try Mercury’s website at: www.mercurymarine.com. While on the website, hover over “Propellers”, and choose “Propeller Selector” from the sub-menu. Can I purchase a new lens for my older Sport or Montauk bow navigation light? Unfortunately, the bow light lens is no longer available for older boat models. The USCG changed the specifications for navigation lights in 1986 and the older light no longer met the degree of range for side views. Perko was the original manufacturer and had to redesign the light to conform to the new Coast Guard Specs. They have not been able to manufacture the older style lens since the change. The newer navigation light can be ordered through your local Boston Whaler dealer only. Please reference the dealer locator on this website to determine the location of your nearest Boston Whaler dealer. Your local dealer will be able to assist you with checking for parts pricing and availability. Do you have any information on hull blistering and the prevention of it? The fiberglass and resin structure of your boat is porous (intrusion of water into the gelcoat will take some time). Blistering is caused by water soluble materials in the hull laminate. The effect of osmotic pressure allows water to impregnate below the gelcoat and substrate, forming a blister. There have been extensive university studies funded by the United States Coast Guard regarding the cause and effect of blisters forming in the gelcoat of fiberglass boats. Fiberglass blisters can form in near-surface layers of gelcoat to very deep into the fiberglass structure. The damage can range from cosmetic to catastrophic, (although the latter is a very rare occurrence). The studies seemed to point toward long term immersion of the hull in warm water as a primary cause of hull blisters. Stress cracks on the hulls below the waterline also contributed to the formation of blisters on the hull. Epoxy barrier coatings can be applied to the hull, followed by bottom paint. An alkyd-urethane silicone marine paint can also be used to aid in the prevention of hull blisters. Reducing the amount of time that your boat stays in the water also helps to prevent hull blisters from forming. Use of a trailer or boat lift will reduce the likelihood of hull blisters forming. Be sure to use a bunk-type lift or trailer for long term storage of the boat out of water. If blisters are present in the hull, they need to be properly cleaned and dried out before any barrier protection can be applied. Contact your local Boston Whaler dealer for more information on the prevention and treatment of hull blisters. For more information on barrier coats, please visit Interlux Products at www.yachtpaint.com. How do I refinish my older Whaler? Gelcoat is the original finish on all Boston Whalers. We recommend using gelcoat for the most durable, longest-lasting refinishing material. Note: Any structural defects will have to be properly repaired before attempting to re-gelcoat. For crazing (fine, cosmetic hairline cracks like a spiderweb), the easiest method for refinishing is prepping the original gelcoat first. Use 50-grit sandpaper to scuff up the finish and knock down any high spots or blend in any imperfections. Blow off the surface with an air blast and then wipe with acetone (this will remove any dirt or wax left on the surface). Blow off the surface again, making sure any moisture, dust or acetone is completely out of the surface cracks. Skim over the surface with either a marine filler or a gelcoat paste to fill in any imperfections. After the filler is cured, re-sand with 100-grit sandpaper to blend in and prepare for respraying. Wipe with acetone as previously mentioned. Mask off areas that are not to be refinished. Note: A surfacing agent or wax should be added to the gelcoat when ordered. This is very important; without the wax the surface will remain sticky after curing. We recommend thinning the gelcoat with Patch Aid. This product provides a uniform finish with minimal yellowing and discoloration. Styrene or acetone can also be used; however, the gelcoat may change colors after a short period of time (styrene) or leave pits (acetone). Note: Experiment with thinning to match your particular conditions and equipment. After the gelcoat is cured, the surface will need to be sanded with several different grits before it can be buffed with an electric buffer and a good paste compound (made for gelcoat). When using a regular sander, we recommend first using a 180-grit sandpaper to get the major orange peel removed, and then wet-sanding with a 500 or even 600-grit sandpaper before attempting to buff. If you have access to a DA (dual action) sander, 240-grit and 600 should work fine before buffing. If considering a polyurethane paint such as Awlgrip or Imron, use the same preparation to fill the imperfections and then follow the manufacturer’s instructions for preparation. A specific primer should be used in each case. Regular boat paint would be the most economical method for refinishing. Interlux or Petit are two of the most popular manufacturers. These can be sprayed or brushed on according to the manufacturer’s instructions. Do you have any instructions for refinishing the mahogany in older boats? Wood components on the older Sport and Super Sport models are made of Philippine Mahogany. When finished at the factory, a clear urethane sealer is applied, followed by several coats of clear urethane with an ultra-violet blocker. Most of the urethane spar varnishes today have a UV blocker added. No stains or fillers are used. The resulting color is a natural reaction of the varnish to the wood. We advise removing the wood from your boat or, at least, protecting the gelcoat surfaces from varnish splatters by taping paper adjacent to and under the areas you will be working on. Varnish on the gelcoat will cause a brown spot that is almost impossible to remove. Sand the surface until all gloss is removed or, sand to bare wood. Varnish removers do not work well with the urethane finish. Apply a coat of urethane marine varnish following manufacturer’s instructions on the package. On bare wood, the first coat will be absorbed into the wood sealing the wood for subsequent coats. Sand with 180-220 grit sandpaper and wipe the surface with a tack cloth between coats to remove sanding residue. Apply another coat of the finish, flowing the varnish in the direction of the wood grain. Repeat steps until the desired finish is achieved. This may require 2 or 3 coats, depending on the consistency of the product being used. Sunlight is the worst enemy for wood finishes. The easiest way to protect your boat from all harmful elements is by keeping it covered when not in use. How do I transfer the remainder of the 10 year Limited Warranty and the 3 year Component Warranty into my name after purchasing a previously owned boat? To transfer the remaining portions of your 10 year structural warranty and/or 3 year component warranty, please register your previously owned boat with Boston Whaler. You can register your boat by clicking here. This link will direct you to a location where you can register your Boston Whaler online and then additionally print and mail/fax/email a form back to Boston Whaler. I think that my older Whaler has water in the hull. How is that possible? Boston Whaler uses closed cell foam in each of its boat models. Closed cell foam does not absorb water. The only way that water can enter between the hulls is through a break in the fiberglass or through an improperly sealed thru-hull drain or attachment. We recommend regularly inspecting your boat’s thru-hull fittings and applying sealant as appropriate. If water is allowed to enter the hull under pressure, it could cause the foam to separate from the fiberglass. This would form a void where water could sit. Note: It is very important to keep your boat’s drains properly sealed, along with keeping up with any hull damage, to prevent water infiltration. Tap the damaged area with a hard plastic tap hammer. A dull thud will indicate a void, or separation of the foam from the fiberglass. Mark the outside of the entire voided area with a marker. Drill from one to several 1/8″ holes (depending on the size of the void) near the bottom of the void. This will allow the water to drain. The void must be dry before proceeding to the next step. Tip: A heat lamp or heat gun may help to draw the water out faster. Be sure not to hold the heat too close, however, as it may cause additional damage. After the void is dry, drill from one to several 1/8″ holes at the top of the void (depending on the size of the void). Proceed to pump polyester resin with a pump gun (available at most marine suppliers) from the bottom holes until it comes out of the top holes. Plug the bottom holes to prevent the resin from leaking out. Allow the resin to cure. Repair any damage that caused the water infiltration and re-gelcoat. Remember: Keep a lookout for hull damage and maintain your drains. How can I view some of the previous boats and specifications that Boston Whaler offered? The find all manuals, spec sheets, performance sheets and other documents for your old Whaler, click here. Float-on bunk style trailer – Bunks should be as long as possible and conform to the shape of the hull to provide good fore and aft support to spread the total weight. For larger/heavier models, you may want to look into two sets of bunks. One set to cradle the keel and another further out for support. Keel rollers or guards can be used on the trailer cross members to provide additional support or protection. A float-on trailer is easier to maintain and works best in boat ramps with deeper water. Keel roller trailer – Keel rollers must be adjusted so that they support the keel and bear ALL THE WEIGHT of the boat. Side bunks should be used to balance the weight on the keel rollers. A keel roller trailer works best in shallow water ramps. Boston Whaler does NOT recommend using an all roller trailer. Side rollers can cause a ripple effect on the fiberglass. This can disrupt the bond between the fiberglass and the foam core, causing potential hull problems. Nothing will discourage a new boat owner faster than an improperly set-up trailer. Therefore, we recommend a careful check of the trailer to ensure that it is set up properly to the boat. Tongue weight should be approximately 10% of the total weight of the tow (boat, motor, contents and trailer). If you have more weight than this, then the front end of your vehicle lifts up and the rear squats, making the vehicle hard to handle. If you have less weight than this, then the trailer is more likely to fishtail. The winch stand should be adjusted so that the bow stop is located just above the bow eye with the winch cable passing just below it. Locating the stop in this manner allows straight pull and provides security in a panic stop, preventing the boat from riding up and over the trunk of the car. You should avoid overrating or underrating the trailer for the boat. Your local Boston Whaler dealer should have an updated weight on your boat, motor and contents. Please contact your local Boston Whaler dealer to help you to determine the value of your previously owned boat. To locate your nearest Boston Whaler dealer, click here. Where does the wiring for my bow light run? On older Boston Whaler boat models (from 1958 to about 1969), the navigation light wiring was molded into the boat. These older boats had a one-piece, white rub rail that was adhered to the hull with the wiring beneath it. 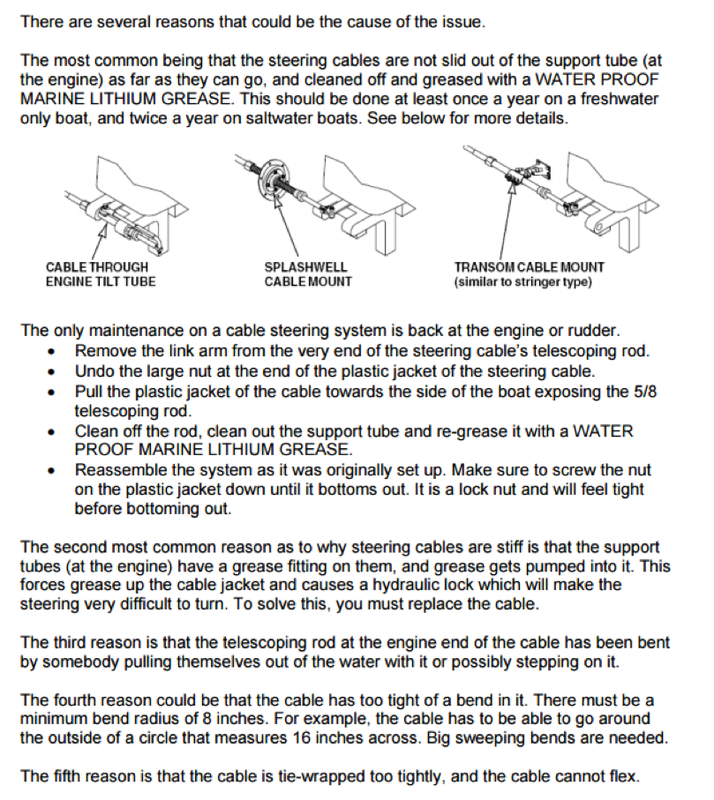 Unfortunately, there is no way to run new wiring into the hull if the old wires are damaged. It is easier to order a newer style rub rail kit. From 1970 and up, boats with a multiple-piece rub rail that were riveted or screwed to the hull have the wiring hidden under the outer rub rail insert. Removing the insert will expose the navigation light wiring. What is the color code and/or part number for my gelcoat? Why are my steering cables stiff? How do I order replacement keys for my Boston Whaler? Replacement ignition and lock keys can be ordered through your nearest Boston Whaler dealer. Please provide the dealer with the specific key number when ordering. When you first purchase your boat, make sure to write all key numbers in the owner’s manual, just in case. If you have an outboard motor other than a Mercury, replacement ignition keys can be ordered through the appropriate outboard dealership as ignition switches are a part of the outboard wiring harness. Can I pull tubes or tow-able accessories with the ski pylon or tow arch on my boat? The ski pylon or tow arch is designed to pull skiers or wakeboarders. Boston Whaler would not recommend pulling tubes or tow-able accessories using a ski pylon or tow arch due to the large amount of stress or “drag” that these items can cause. Using a pylon or tow arch inappropriately could cause personal injury and/or equipment damage. Boston Whaler would recommend using a good tow bridle attached to the two thru-bolted stern eyes to pull tubes and tow-able accessories. How do I install the older style, 3-piece rub rail on my Classic Boston Whaler? Remove the old rub rail by first pulling out the black insert, exposing the rivets. Drill out the head of the old rivets and remove the rigid rub rail and flexible vinyl. Any rivets that are sticking out just hit them below the surface with a hammer (or cut off with a sharp chisel) and fill in the old holes with some Marine-Tex epoxy putty, polyester resin paste or 3M 5200 marine sealant adhesive. After the sealant or filler has cured try and get the black insert as warm as possible while you are installing the rest of the rub rail. Placing the insert into a black plastic bag (and allow to sit in full sun) or in a tub of hot water, helps it to become more pliable and fit into its track later. Tape the smaller, L shaped, flexible vinyl (wider lip on top of the gun’l) around the gun’l using 1″ masking tape. Starting at the aft end of the boat, start riveting the rigid rub rail (with the lip on top) working your way to the other end of the transom. If in a cold area, you can heat the rigid vinyl with a heat gun to allow it to bend around the bow easier). Cut the vinyl even with the transom using a hacksaw. Using a file, or other tool, round off the inside track a little to allow the insert to wrap around to the back of the transom as shown on the installation diagram. A little dishwashing liquid with water around the rigid rub rail track will help the black insert pop into its track easier. Starting at the stern, place the insert into the top and bottom tracks of the rigid rub rail, about 2 feet at a time. After the top and bottom lips of the insert are in place, hit the center of the insert with a rubber mallet to pop it in place. Work your way round the boat (a few feet at a time) and then finish up the ends at the transom as described in the installation diagram. *Click here for installation diagram. Please note that the part numbers listed on diagram are no longer valid.